Monday - Friday 9AM-6PM PST. The Diablo Predator for the Dodge Hemi trucks and SUVs is a performance tuning flash programmer in a handheld design. The Predator is pre-loaded with DiabloSport's dyno tested performance settings ready for you to install. Each performance program developed by DiabloSport is created after extensive research and testing to ensure maximum performance, efficiency, and reliability. The DiabloSport Predator is the first and last handheld tuning device you will ever need for your vehicle because it comes with pre-loaded tunes for plug-and-play results, lets the end-user adjust popular parameters if desired, and can accomodate multiple custom tunes developed by any DiabloSport CMR tuning facility in your area for highly modified custom applications. Plus, the Predator is a handheld diagnostic tool that can read and erase diagnostic trouble codes (DTC's) that cause check engine lights. The DiabloSport Predator is also online updateable/upgradeable. This means that all software updates/upgrades released in the future will be free to the end-user. This is a valuable feature that saves time and hassle of shipping the Predator back to DiabloSport for software updates. Instead, all the end-user has to do is uninstall the Predator from the vehicle, connect the DiabloSport Predator to their PC using the optional PC Interface Kit, download the free updates and interface software from DiabloSport's website, install the update on the Predator, and then reinstall the Predator in the vehicle. A DiabloSport Predator equipped vehicle will have increased driveability. The additional power and improved shift characteristics created by the DiabloSport tuning results in quicker acceleration and improved efficiency. The power increase in the lower RPMs will yield a better throttle response. Created for vehicles running 93 octane fuel for maximum performance. Power is increased by 25HP and 30TQ. Created for vehicles running 91 octane fuel. Power is increased by 20HP and 25TQ. Created for vehicles running 87 octane fuel. Power is increased by 15HP and 20TQ. The DiabloSport Predator for the Dodge Ram Hemi also offers the end-user the ability to further fine-tune the vehicle to their needs. 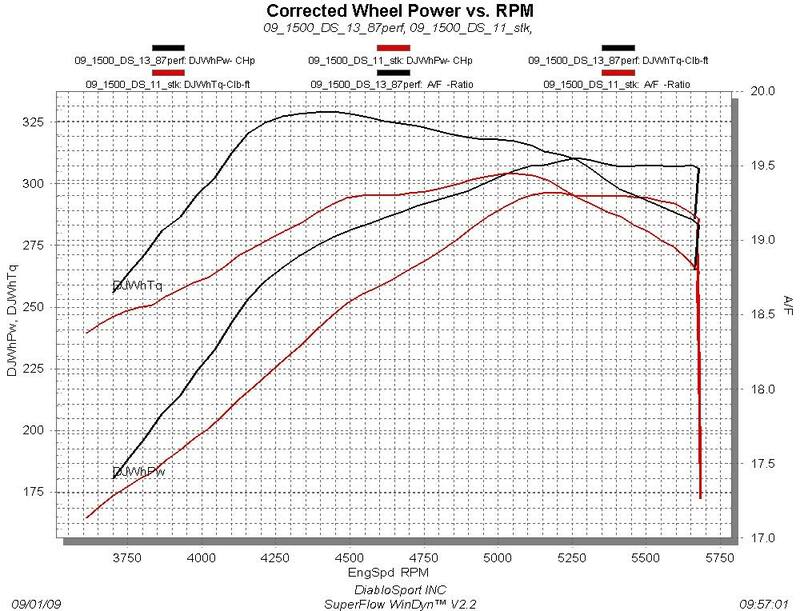 If you have some other modifications done to your Dodge Ram Hemi truck or SUV that requires a little more fuel or spark advance, or you want to adjust your tire size for non-factory sizes, or even if you want to raise the speed governor/limiter, then the DiabloSport Predator has you covered. Below is a list of end-user adjustable parameters. These parameters can be used to amend the pre-loaded DiabloSport tunes or even just change a few things of a copy of the factory program. The flexibility of the Diablo Predator is endless. If the parameters below don't meet your needs exactly for some custom applications, then just take your DiabloSport Predator to your local DiabloSport CMR center for a full custom tune. The Predator can hold multiple CMR custom tunes in addition to all of the pre-loaded DiabloSport engineered tunes. Adjust TPMS (Tire Pressure Monitoring System) threshold for trucks/jeeps that want to run low tire pressures when running off-road. Axle Ratio setting is NOT adjustable because the vehicle measures speed AFTER the carrier. Rear axle gear swaps do not need recalibration for proper speedometer read outs and shifting. Only tire size changes require computer recalibration. Torque management changes are very complex to do so a custom CMR tune would be necessary to have them remapped to your desire. The torque management setting are already optimized in the Predator tunes. Cold Air Intake tunes are not included because, after many hours of dyno testing, DiabloSport found no need for custom air intake tunes. The truck/suv settings do not lean out the fuel mixture with cold air intakes like they do on the hemi cars. So that is why special cold air intake tunes are not installed; they are completely unnecessary. Some of the adjustable parameters listed above have notes indicating that they do not work on some model years. Despite the popular belief that all 2003-2009 Dodge Ram Hemi trucks are the same from year to year, that is fundamentally false. The Dodge calibrations and software systems changed over time and therefore the computer is mapped out differently from year to year. This complicates the process of creating tuning and the ability to further adjust certain parameters. The parameters and strategies that control certain functions are computed differently. DiabloSport is working on adding these features for the model years that are not supported as indicated above. All software updates and software feature enhancements are available on DiabloSport's website and are free of charge. So, when DiabloSport releases future software upgrades, they will be available for download to the end-user. At this time, there are no deadlines for the the software updates to add new features to those model years. Plug the Predator into the diagnostic port under the dash. Select to install the performance tune of your choice. Wait while it saves all of the original factory settings. When the Predator is finished, unplug it from the vehicle and save for future use. That's it. Start your vehicle and enjoy the ride. It is important to note that a PC Interface Kit is required to update the Predator or possibly your vehicle's computer in order for them to communicate properly. When attempting initial installation, the Predator will check to see if the software on your vehicle computer is compatible with the software of the Predator. If they are not compatible, then the Predator will notify you as to what you need to do. Either way, the PC Interface Kit is a necessary item to complete this process so that you can download the necessary data required to update the car or the Predator itself using your home office PC. It will not work on a MAC unless it has a Windows operating system installed. Support added for 2005-2008 Jeep Grand Cherokee, Jeep Commander, and Dodge Durango. Fixed missing/removed transmission control options for 2005 Dodge Ram trucks.